It seems that a one-week trip to the shore, with days spent digging for clams and nights spent camping under the stars, has long ago ceased to be enough of a diversion for families planning their summer getaways. Now, the options range from cooking lessons in Italy (with even toddlers getting some kitchen time) to marionette-making courses in Prague to “volunteer vacations” that include trips to orphanages in China. 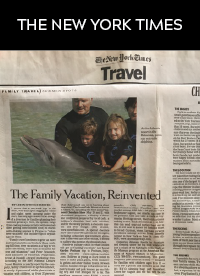 “Family travel continues to grow as more and more parents, particularly those working full time, view vacations as a way to ‘reunite’ the family, more than an occasion for rest and relaxation,” said Peter Yesawich, chief executive of Yesawich, Pepperdine, Brown & Russell, a travel marketing firm. According to the 2007 National Leisure Travel Monitor, a yearly report by the company, family travel will be up this summer, as nearly 40 percent of adults plan to take a vacation with children, up from 32 percent five years ago. Here are some of the many choices available for families this summer.